Cisco-Eagle helps companies automate everything from packing to picking to assembly. We can help you understand the advantages (and limitations) of automated material handling systems as they pertain to your situation. Our engineering group and partnerships with major automation equipment manufacturers can guide you through the process of taking the next step on the journey to an automated solution. That solution may encompass your entire operation, or just parts of it. Call us today or submit the form to the right to get the ball rolling. We can help you survey your site and work through the process. 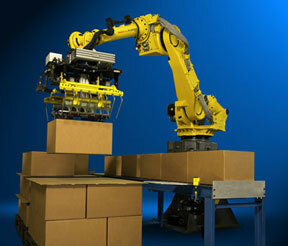 Robotic palletizing systems from Fanuc help increase throughput and quality. Cisco-Eagle can help you integrate your system with conveyor lines and other equipment for a truly integrated system. Robotic systems are ideal for structured order picking. With the right vision systems and effectors, we can help you create a system that offers near-human flexibility and selectivity. Automation of high speed packing functions can help your operation reduce errors and increase throughput. AS/RS systems can transform picking operations by combining high-density storage with data-driven automation of mini-load and unit load issues. We specialize in conveying systems, sortation systems, and advanced controls that tie together people, processes, and business goals. Tie your operation together and increase throughput with high-density pick module systems. We provide Hanel vertical systems for "goods to picker" product flow that increases throughput, reduces errors, and saves space.